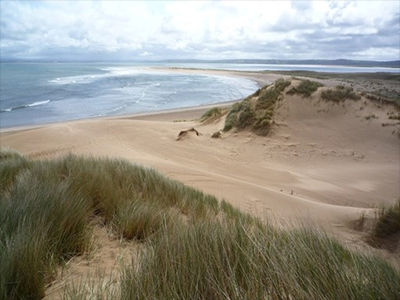 Sand dune habitats are one of the most natural remaining vegetation types in the UK. They support more than 70 nationally rare or red-data book species, and are a refuge for many lowland species lost due to agricultural improvement. Dynamic dunes are naturally dynamic but this situation has changed over the last 50 years. We are studying why this is, and what the impacts are. 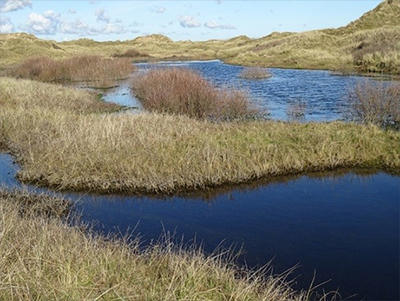 Dune slack wetlands are sensitive to climate and nutrient enrichment. We are studying the complex interactions between hydrology, plants and soils to predict the impacts of climate change. Nitrogen impacts: Nitrogen pollution causes dramatic loss in dune biodiversity and alters soil processes. We use field-experiments, surveys and modelling to measure and understand these effects. Dunes are naturally dynamic. However, over recent decades, dunes across north-west Europe have become over-stabilised, due to a combination of reasons. We have been studying change over time at Newborough Warren using a chronosequence (studying dunes of different ages). 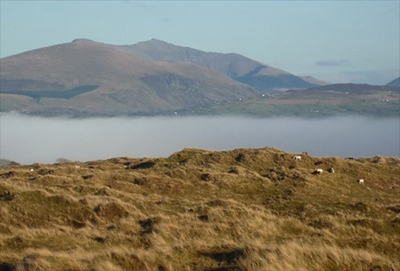 This suggests that changes in climate and increases in nitrogen deposition are important factors in promoting dune stability and soil development, as well as reductions in traditional management practices such as grazing. 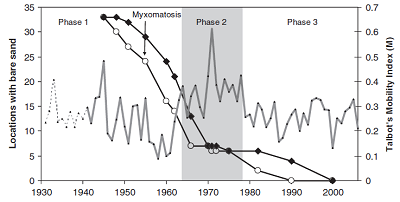 Interestingly, many of these changes started before the rabbit population was devastated by myxomatosis. Dune slack plant and animal species depend on the groundwater regime, but their requirements are poorly understood. 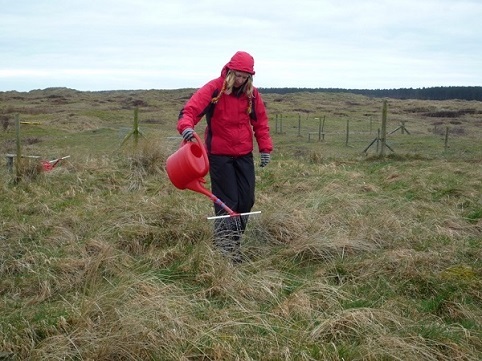 We characterised hydrological tolerances of dune slack vegetation across four UK sites. A 20 cm difference in average water table regime separates wetter and drier slack communities, and only a 60 cm difference separates the wettest slack community from dry dune grassland. However, while we know that water tables can vary substantially from one year to the next, we are still not sure how quickly plants respond to changes in hydrology. We set up a study to assess the impacts of nutrients in groundwater on dune slack plant communities. 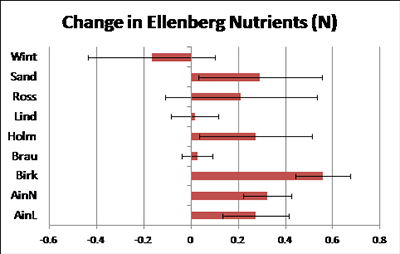 This showed changes in species composition at very low nutrient concentrations: as little as 0.2 mg L-1 dissolved inorganic nitrogen in groundwater (equivalent to 0.9 mg NO3 L-1). 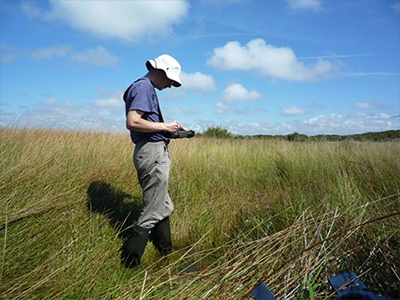 We re-surveyed dune wetlands in England after a 22 year interval, in a study for Natural England. 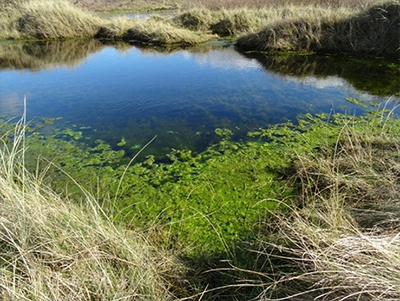 Results show a 30% loss in wetland extent, a change from wetter to drier vegetation types at many sites, and a consistent increase in nutrient status of the plants. 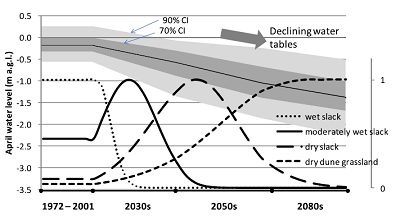 This suggests rapid change in an important habitat for lowland biodiversity. 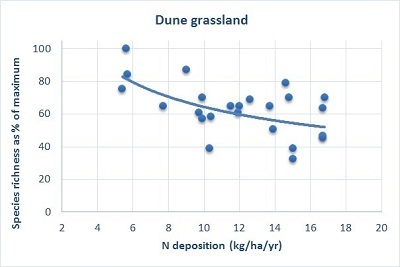 Nitrogen is one factor contributing to over-stabilisation of dunes. Because it stimulates plant growth, fast growing species outshade smaller and slower-growing species, leading to a loss in diversity. A gradient study suggests that higher levels of nitrogen pollution from the atmosphere have resulted in a 50% loss in species across much of the UK, compared to the cleanest sites. Earlier work showed that nitrogen also alters soil processes in dunes, with more nitrogen available to plants. We set up an experiment in 2003 to see whether management by grazing would reduce the effects of nitrogen. 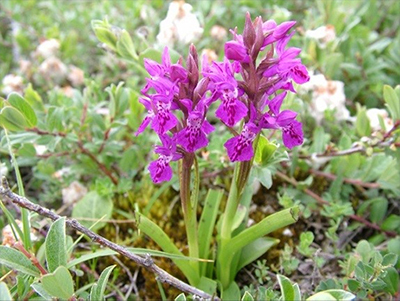 Results showed that nitrogen is taken up and stored in the vegetation, but has not yet had an effect on plant composition. This may because plant growth is limited by other nutrients. Recent work for the JNCC and for the Scottish Environment Protection Agency (SEPA) is designing ways to assess whether a particular site is impacted by nitrogen deposition. This will use plant abundance data collected on-site, and calculating different indicators such as average vegetation height, grassiness of the vegetation, plant species richness and presence of nitrogen-loving (nitrophiles) and nitrogen-hating (nitrophobes) species. Combining information from these indicators and comparing with data from other sites is a powerful way to detect whether a site is being affected by nitrogen. 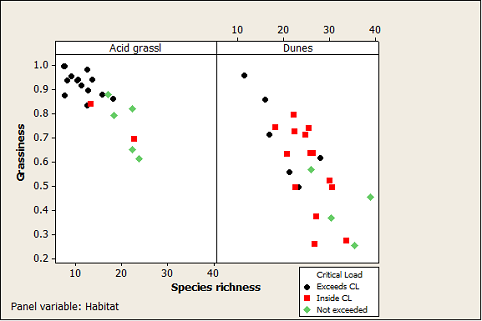 Graph: Combining indicators such as ‘Grassiness’ and ‘Species richness’ can provide site-based evidence of effects due to exceedance of nitrogen critical loads.